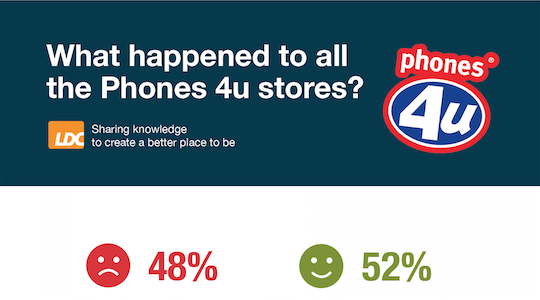 Infographic - What Happened To All The Phones 4u Stores? It has been over 12 months since Phones 4u went into administration. Phones 4u was a large mobile phone retailer in the United Kingdom with 554 stores at the time it went into administration on the 15th September 2014. Vodafone and EE decided to not renew their contracts with the company, meaning the business had no more telecom clients. LDC updated the market on the progress of the stores in April 2015, and recently revisited the Phones 4u store portfolio one year after its administration.